Get an AOTA Digital Badge on Path to Leadership to share your learning accomplishment when you complete the required CE. 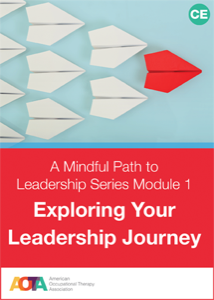 This module supports the exploration of leadership from the inside out through the identification of core values, purpose, and person mission, leading to authentic and trusting relationships with others. This module will help you to identify what you want to accomplish with your life and create a personal trajectory to put you on a mindful path toward your preferred future.